The Specialized Information Services (SIS) is responsible for health information in the areas of toxicology, environmental health, and HIV/AIDS, and includes the Office of Outreach and Special Populations, which addresses the health info needs of minority and underserved health professionals and the general public. SIS has several new or recently released Web and PDA-based products that are at a point where evaluation is required to determine next steps and product viability. 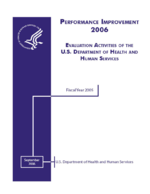 These products and proposed evaluation methods are: (1) WISER (Wireless Information System for Emergency Responders) http://wiser.nlm.nih.gov/. Up to eight U.S. fire departments will use WISER on-the-job and provide feedback on their experiences. (2) TOXMAP http://toxmap.aquilent.com/toxmap/main/index.jsp. Two online focus groups, one of GIS professionals/public health workers/researchers, and the other of interested citizens. (3) Tox Town http://toxtown.nlm.nih.gov/. Study of high school students’ and educators’ opinions and preferences for graphical vs. text version. (4) TOXNET and ChemIDplus http://toxnet.nlm.nih.gov/. Usability study of search and navigation functions. Health information web sites for and about specific populations: Arctic Health at http://www.arctichealth.org/; Asian-American Health at http://asianamericanhealth/; and American Indian Health at http://americanindianhealth/. There is one focus group about each Web site for its target population.